In 2013 we continued research and development work, publishing papers on new library preparation protocols, and evaluating a new sequencing technology. The work focused on working with samples containing low-input degraded DNA, and on automating sequencing library preparation protocols. These methods already play a role in our ongoing research, and should be useful to the scientific community at large. In addition, we are pleased to report the publication of a couple of papers primarily driven by our collaborators. 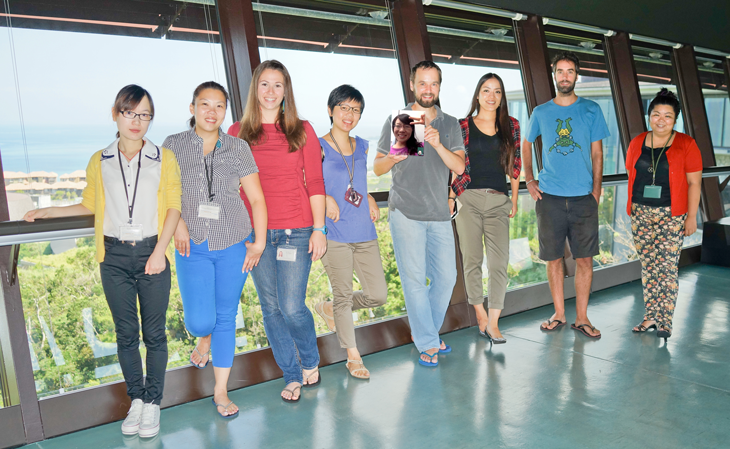 Tsai-Ming worked on annotating genes involved in meiosis in the little fire ant (Wasmannia auropunctata), while Shikha worked on snake venom proteomics in two Okinawan habus. We expect that both studies will be submitted for publication in FY2014. Next-generation sequencing has given us much more genetic data than ever before, opening entirely new research directions. Unfortunately, many of the protocols for preparing DNA for sequencing rely on the availability of high-quality starting material.Many of the most interesting samples, such as those collected a long time ago, or under non-optimal conditions, say in the field, have badly degraded DNA, making it difficult to prepare sequencing libraries. Inspired by a lunch time conversation with our former president Sydney Brenner, we developed a protocol that permits genotyping of samples with very low quality starting DNA. Figure 1. Schematic overview of the library preparation process. This protocol allows for both reduced reprentation (RAD-tag) and whole-genome sequencing of degraded samples. Both RAD-tag (left) and whole-genome shotgun (right) library preparation methods start the same way, and diverge only at the final stage. This protocol works with small amounts of DNA, perhaps just a couple of nanograms for insect-sized genomes. In addition to the library preparation protocol, we also presented a DNA extraction recipe, which only minimally damages insect specimens. This allowed us to genotype museum specimens, analyzing their DNA, while preserving the exoskeleton for more traditional morphological analyses. Figure 2. A hundred year old ant pre-and post DNA extraction. The ant on the bottom has been sequenced, and the one on the top is from the same nest series. These worker of the invasive ant Argentine ant (Linepithema humile) was collected in 1920, but we were able to extract and sequence their DNA using the new protocol. The specimens showed some discoloration around the eyes post-extraction, but were otherwise undamaged. RAD-tags are a cost-effective reduced representation genotyping technique, which is extremely popular molecular ecology and evolution studies. This technique targets genomic regions surrounding restriction enzyme cut sites, which allows only a fraction of the genome to be sequenced, reducing costs, while providing ample data for a range of applications. Unfortunately, this method requires PCR amplification of the libraries, potentially introducing duplicate reads into the data. While not a problem in many cases, because they are not statistically independent, duplicates can produce major artifacts in degraded samples, as well as sample-to-sample variability in other types of samples. Our method allows each molecule in the digested DNA to be individually barcoded, allowing the later bioinformatic detection of duplicates. Because of their relatively low cost and high throughput Illumina sequencing platforms are the most popular for RAD-tag analysis. Illumina sequencing also allows for mutliplexed sample sequencing using index reads. We modified the index sequences to attach a random tag to each molecule being analyzed. This tag is (almost) unique to every molecule. After our reads are mapped, we can identify molecules with the same tag, and be reasonable sure that they came from the same original template. Figure 3. Adaptor design for the new RAD-tag genotyping method. In this case the target DNA is flanked by two restriction enzymes, and ligated to two separate adaptors, each containing an Illumina index. The adaptor tag is the random sequence, which is ligated to each target molecule. 3.3 Investigating the MinION sequencer. We had the exciting opportunity to look at Oxford Nanopore’s MinION sequencer, and evaluate the performance of its first generation. Although this technology has promise for potential diagnostic applications, there is still room for improvement, as it has a high error rate, which is common to single-molecule sequencing platforms. This has been our most read paper by far. Figure 4. Read lengths and error profile of the MinION. 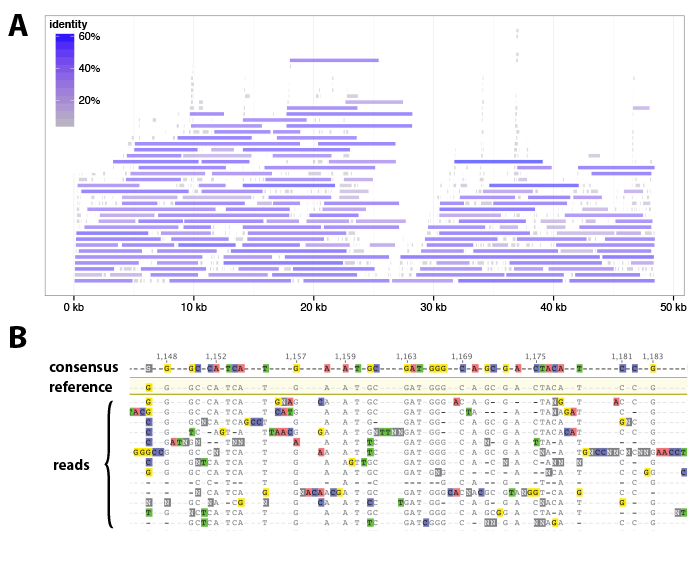 Here we sequenced the lambda phage, mapping the resulting reads back to the reference sequence. (A) The reads were quite long, reaching over 10kb in length. (B) The accuracy of each read was relatively low, on the order of 20%. One of our earliest experiences with next-generation sequencing was to help our friend Oleg Gusev with his project on the genomics of the amazing desiccating midge (Polypedilum vanderplanki), the only insect that can undergo complete reversible desiccation as a larva. After years of work, we are happy to see this work finally published. 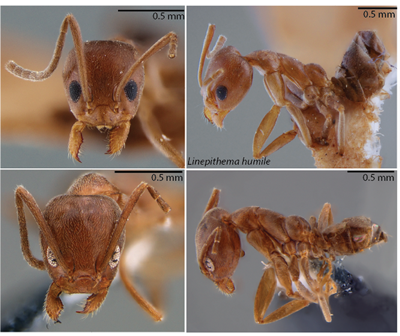 In addition, Misato has published a paper describing a new reproductive for of the ant Vollenhovia emeryii, currently in press in Myrmecological News.